Since I’m more on top of things this time around and I haven’t shared this here yet, I figured I ought to post my Iron Painter 2018 round 3 entry. The theme this round was “Monster Mash”; this entry was challenging, but so much fun to do! 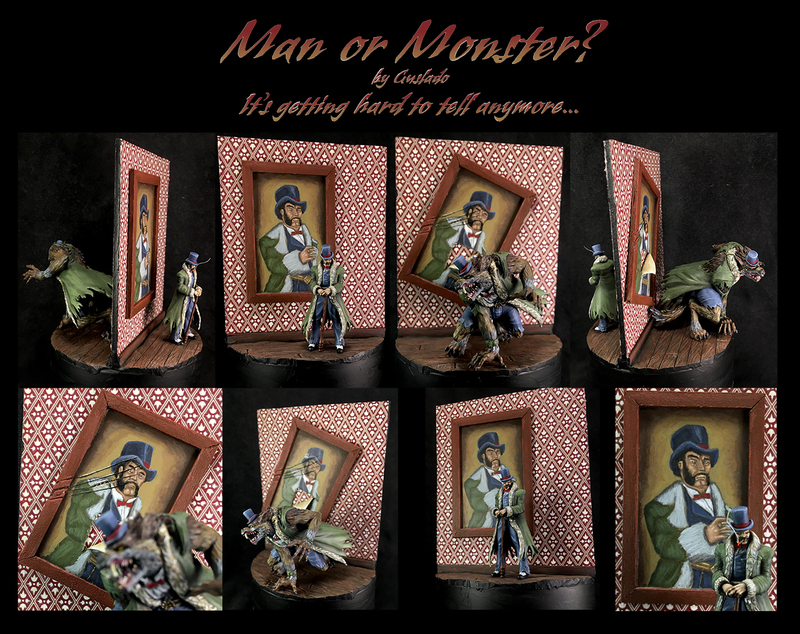 I based the paintings on the wall off of the original image of Ferdinand Vogel from the Divergent Paths campaign, way back when he first arrived in Malifaux and before all of the events occurred that made him the man (or monster) he is today. The two framed paintings were entirely freehand painted. I made the wallpaper by creating a vector pattern in Illustrator, which I glued to the wall and then painted over to give it depth. I hope you enjoy this piece as much as I enjoyed creating it! I ended up winning my match-up and continue to fight on in the Silver Tier! This looks terrific; a well-earned win to the next round.